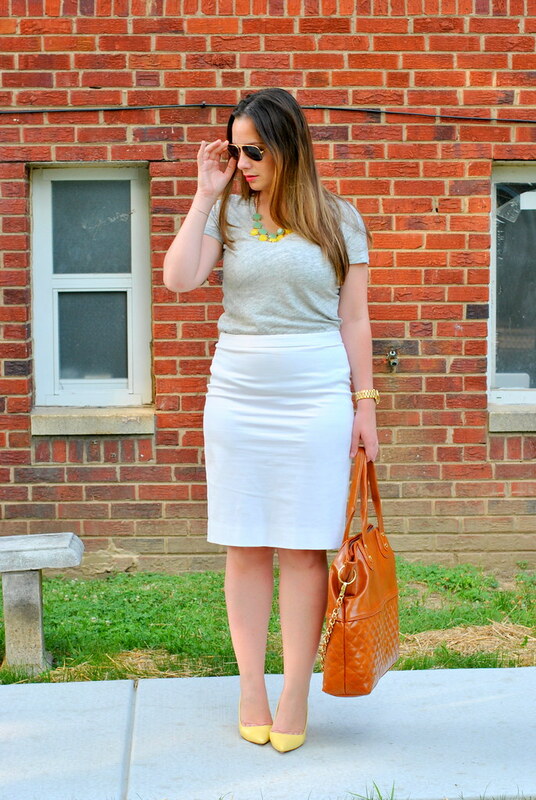 The deets: J.Crew tee & pencil skirt; Zara heels (similar); Ray-Ban sunnies; Steve Madden bag (very similar under $40); J.Crew Factory necklace (similar, similar). It has been HOT here in DC. Like, step outside and immediately have flat swampy hair and sun burned watch tan lines. It's not the most professional look, but a breathable cotton tee is the most I could handle last week, especially since I walk about half a mile to the metro every morning. Thank heavens for necklaces that can fancy up the situation. 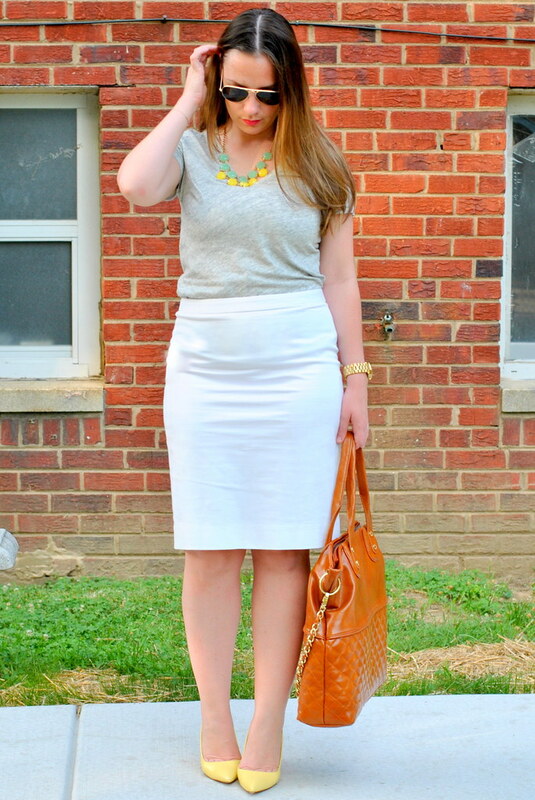 I know I wore this necklace shoe combo in the last outfit post but I just feel they are meant for each other. Bright colors like yellow with white are just what I tend to reach for on hot summer mornings. You look gorgeous! I love the touches of yellow! I am glad you are getting nice weather in DC! I know here in Canada we had a really cold and long winter, so even though it's been really hot here as well, I am biting my tongue and refusing to complain. Lovely look. 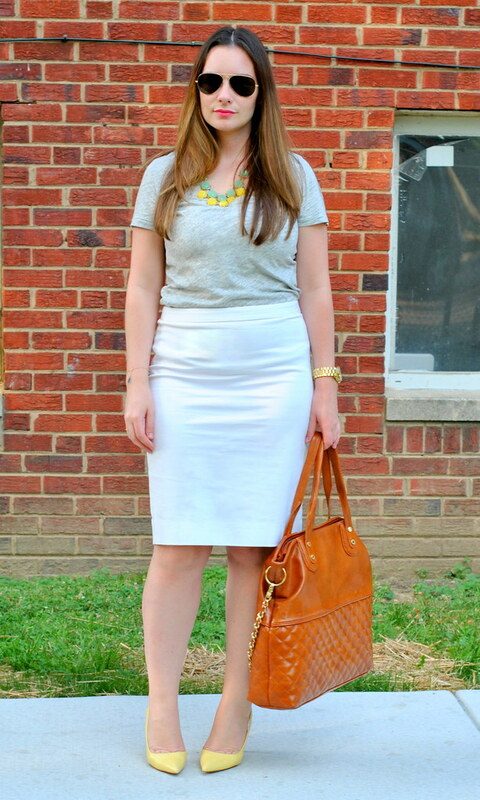 That white skirt is such a classic. Love it with the yellow.